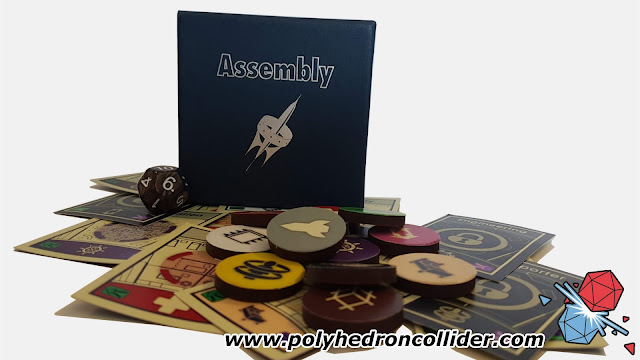 Part of me is tempted to write this entire review for Assembly in the style of the game, mainly because the setting for this little 2 player game is both wonderfully simple and rich. But, I fear that would get old very fast, so I shall just wax lyrical in my typical rambling fashion. The final version will look very different, but I find the small bow and cards to be very functional. But, you have only limited access to commands and each command needs to be verified by the only other survivor. Who is stuck on the other side of the airlock. And, because of the damage done to the station (or because the station has gone Hal crazy), the communication network is glitchy as hell. And the station is starting to malfunction. A lot. This compelling sci-fi backdrop sits behind a puzzling abstract micro-game which is, quite simply, pretty damn great. I especially enjoy playing this game solo, due largely to the fact that I repeatedly Ace Rimmer the smeg out of it. Whereas playing it two player “someone” keeps letting the side down. I got very lucky on the first module, but do we lock down just the one bay? The goal of the game is to realign each of the 12 Bay cards with their connected Room Modules tokens which players will draw and place randomly throughout the game. To do this you have your Command cards, a deck 16 cards, but with only 6 different commands, allowing you to add new tokens, rotate, switch and most importantly, lock them in. You’ll need to lock down all 12 before the deck circles through twice to beat the game. Mechanically that's it, but the mechanics of the game are only part of it. The crux of the game in the two-player mode comes down to communication, each player must work autonomously - despite this being a co-operative game, where the cooperation comes from a shared goal and an intersection of individual actions. 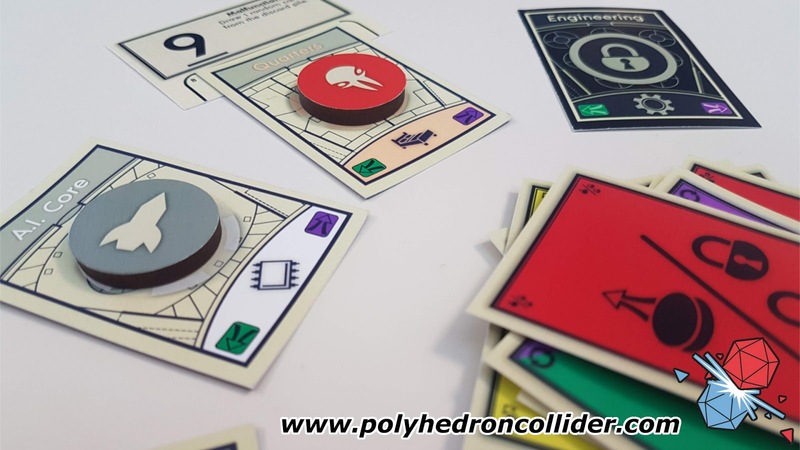 The game centres around the idea that players don’t discuss their plans, or share what their cards are, all that information is and remains secret. The active player chooses a command from their hand of three cards, the support player then must verify that command with a simple ‘yes’ or ‘no’, in other words; do they have the same card - in essence; can that crew member also enter that command into their terminal. If it’s a “yes”, everything is peachy, the command is executed and, all being well you’re now one step closer to getting back to Earth. But a “no” doesn’t necessarily halt the progress, it means that if the active player wants to commit that action, the support player must discard a card to “override’ the system. This can be heart-breaking, plan-destroying and really, REALLY annoying. The active player switches but now, now, because of that smeghead on the other side of the airlock, you’ve got fewer choices. And fewer choices is bad. Co-op games can suffer from quarterbacking; where one player takes charge, essentially taking everyone's turn for them. Assembly not only makes that tricky but it actually punishes the quarterback if they rear their head. It challenges players to become telepathic, which is no bad thing if gaining superpowers was that easy, or perhaps more realistically, it challenges players to synchronize their thinking and plans. 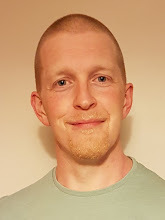 You’ll very quickly realise how alike you are in your pattern of thinking to your support player in how you deal with your train of thought, how your problem solves and how good your memory is. It’s quite an unusual sensation mentally screaming at the other player to perform a switch command, because you can verify it, and then in your turn lock that bay down. Normally, when you see a perfect solution to your problem in a game, your screaming “Don’t do it, anything but that one.” You do that thing where you try not to look at the card you want. That is flipped on its head here which makes for quite a unique feeling. Obviously, they never do what you want them to do, invariably, they have their own plan. Smegheads. If, however, you are sick of being let down by your support player you can very quickly and easily play this game alone - by just removing a few cards. To be honest, I prefer Assembly as a solo game, having to tease out the puzzle solo presents enough of an engaging, puzzling challenge, and with such a short play time I can bash a game out while there's a pizza in the oven. Also, no-one lets you down. Once you’ve mastered the simple version of this game you can throw in the malfunction cards - where the station starts to break down and fights you back. These will only affect 4 bays (those at 12,3,6, and 9) and ramp up the difficulty and frustration nicely. After that there are more ways to make the game more of a challenging...but I haven’t go there yet, but it’s a comfort to know they are there...sort of. These add an extra twist, an extra consideration and ramp the difficulty up quite nicely. One issue that can creep into games though is players “bending” the rules. Now I take my rules and gaming very, very seriously (look, I’m a nice guy but once those cards have been dealt and the dice rolled I don’t give a monkey’s about your dog/kids/wife/husband/job/parents/garden/car - just shut the hell up and play). 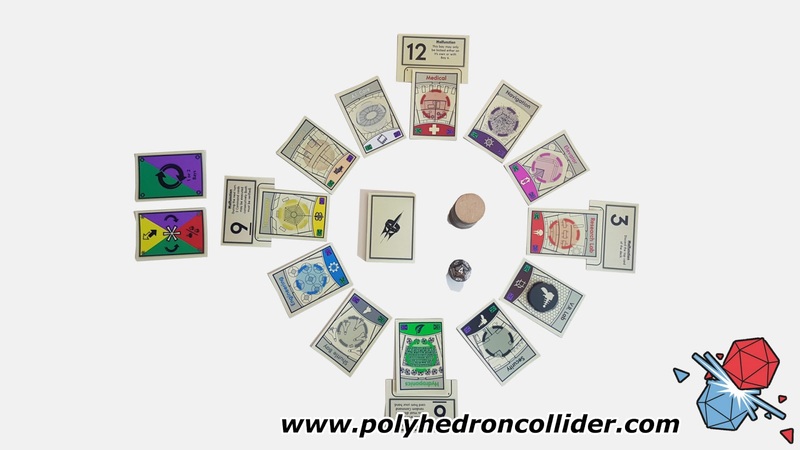 There are three modes of play that relate to communication ranging from a general discussion on what players should focus on - to absolutely no verbal communication at all - the rulebook comes with a sign language section that covers all the command words you’ll need to play it. 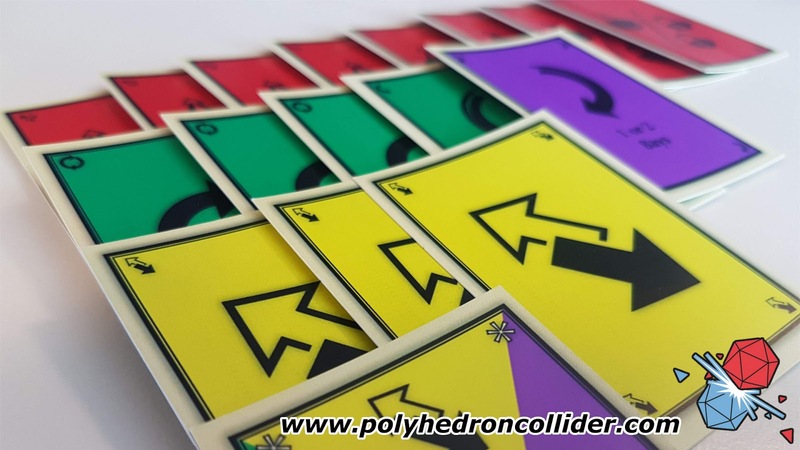 How you choose to play is in your remit, but one slip, one moment of frustration can reveal important information that can steal some of the fun of this game, but, it is all in how strictly you choose to follow the rules. 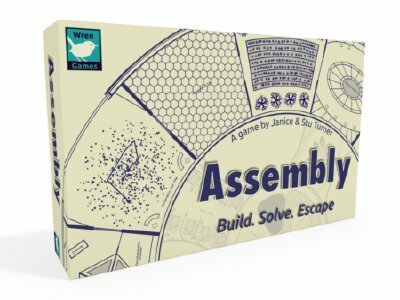 What you’ll get with Assembly is a neat puzzle game, but more than that, this strikes a great co-op chord. Not only does a victory feel especially shared and equally achieved, but in playing this game you’ll create a muster point of thought, where there is a degree of pleasure and alarm (in almost equal measure) when both players are on the same page. 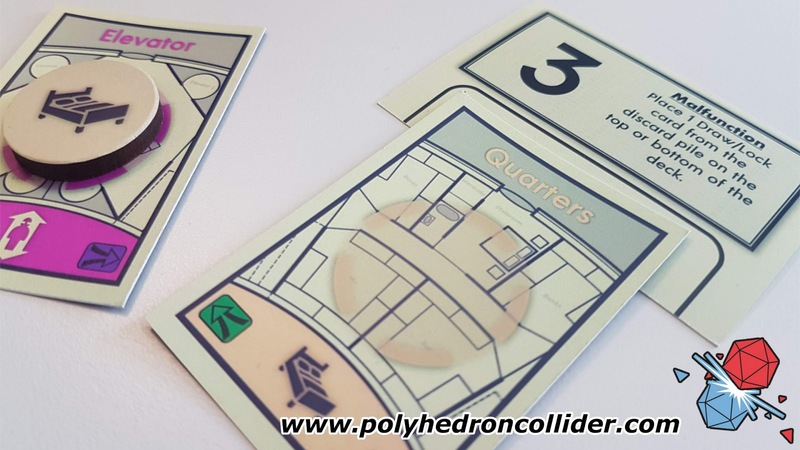 I find myself often impressed by microgames, the austere and economic design is something I can really appreciate, it also means that you can get a great game without too much damage to the wallet. Assembly is on Kickstarter now for £16 and for that, you’d be a smeghead for missing out.